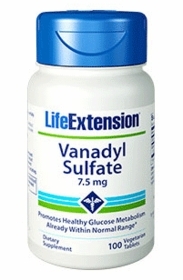 Vanadyl Sulfate mimics the effects of insulin in the body, lowering blood sugar levels and enabling some people to use less insulin or stop having to use insulin. Body builders found that vanadium produces an anabolic effect that improves muscle to fat ratios. Vanadyl Sulfate is a safer form of vanadium used to lower blood sugar levels. Dosage and Use: Take one (1) tablet daily with or without food, or as recommended by a healthcare practitioner. Diabetics caution! Only diabetics using a glucometer should experiment with vanadium products. It is essential to ascertain exactly how low vanadium will cause blood sugar levels to drop. If you have any questions, please contact us at info@lifeextensionvitamins.com or 1-888-771-3905.